Welcome our 30th member - Erica Gale! 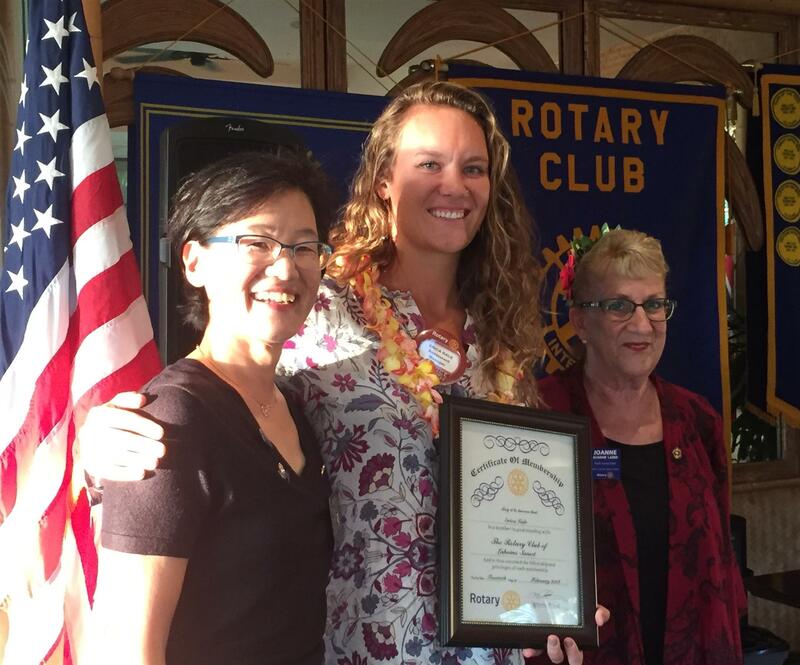 On Tuesday February 20th Erica Gale was the 30th member to be inducted into the Rotary Club of Lahaina Sunset. Erica is from the small ski town of Steamboat Springs, Colorado. She grew up competitively skiing in the winter and swimming in the summer, and traveling as much as possible in between with her parents and younger sister. From a young age, her mother made sure that every month Erica and her sister volunteered at a location of their choice, which was usually with the cats at the animal shelter. Erica also got her sense of adventure from her parents, who traveled often for work and leisure. Her first international trip was in 8th grade, where she spent 3 months in Stockholm, Sweden, on a cultural exchange. The next was through Rotary, which took her to Sardinia, Italy for a year during her junior year of high school. Erica has since lived in Spain, Dubai, China, and multiple places in the U.S., but is happy to call Maui home. Even though she loves skiing and the mountains, Erica moved to Maui to escape the snow about 6 years ago. Erica is the morning manager at Down the Hatch Restaurant. Erica is particularly excited to become more involved in local youth mentorship programs, international community building, and the Rotary Youth Exchange program.